When we steer the discussion away from issues to attack the credibility, motives, or character of our debate partners, we often resort to a technique known as the ad hominem attack. It's unfair, it's unethical, and it leads to bad, expensive decisions that we'll probably regret. 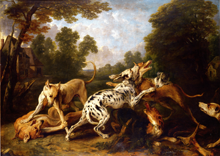 Dogs Fighting in a Wooded Clearing, by Frans Snyders (1579-1657). If a group becomes tolerant of interpersonal attacks, people begin to anticipate them. An increasing fraction of total effort is devoted to plotting and defending against personal attacks. The overall feel of such a meeting is not unlike the scene in this painting. Oil on canvas, circa 1645. Photo available at WikiMedia. Luckily, Greta had a mouthful of salad and couldn't respond immediately to Walt's "You argued for the opposite position on Marigold." If she could have responded, she realized, she would have fallen into Walt's trap. While he continued on, she finished chewing, and then carefully set down her fork. Then she let him have it. "Whether I took a different position on Marigold doesn't matter. The question now is: should we use Houston for Metronome, or should we do the work here? I admit that I'm an imperfect human being, as I'm sure you would admit that you are too, but the question is: can Houston do the job?" Silence around the table. Walt seemed a little stunned. Greta picked up her fork and resumed work on her salad. Walt has just paid the price for using a type of rhetorical fallacy known as an ad hominem attack. It's powerful and it can lead a group into a wilderness of confusion and sloppy thinking, where bad decisions are born. Many of us are unprepared for ad hominem attacks. Even if we are prepared, in the heat of debate we can forget what we know. There are three common forms of the ad hominem fallacy. and bad decisionsdirect attack on your humanity. The logic: You're a rotten person; therefore your assertion is false. Example: The last project you managed was 30% over budget, so I don't believe your projections on this one. The tu quoque form tries to demonstrate that you're inconsistent or hypocritical. The logic: You once said something different; therefore you aren't credible; therefore your assertion is false. Walt tried this one on Greta. The circumstantial form is an attack on your associations — your job, your heritage, or other affiliations. The logic: You have rotten friends; therefore your assertion is false. Example: Since you're a hardware engineer, your suggestion that we fix this in the software is wrong. What can you do about an ad hominem? If you defend yourself or respond in kind you'll only help your partner take the discussion off point. Instead, get back to the issues. Greta did it masterfully. As a spectator identify the ad hominem to the group — you have more credibility than the target does, because you aren't directly under attack. And you have a right to demand that the debaters stick to the issues. Better debates start with you. If you slip up, apologize to your partner. If not immediately, then later, privately. For more on ad hominem attacks, see "Some Subtleties of ad hominem Attacks," Point Lookout for November 14, 2012. Would you like to see your comments posted here? rbrenugNGBEkLIqPGMntdner@ChacNcuUcLhYZFOaVzmfoCanyon.comSend me your comments by email, or by Web form. If you like to browse in bookstores, you probably know the thrill of new ideas and new perspectives. When I find a book worth reading, I want to own it, and that's how it gets to my shelf. Here are some tips to help you read more of what you really want to read. Modern team efforts almost certainly involve teleconferences, and many teleconferences include presentations, often augmented with video or graphics. Delivering these virtual presentations effectively requires an approach tailored to the medium. Much has been written about how to conduct meetings effectively. Here are some reliable techniques for doing something else altogether. See also Personal, Team, and Organizational Effectiveness, Effective Communication at Work, Critical Thinking at Work and Rhetorical Fallacies for more related articles. I offer email and telephone coaching at both corporate and individual rates. Contact Rick for details at rbrensqtpFNEpuqmOhquuner@ChacDkgtdouwFzBGfnsxoCanyon.com or (650) 787-6475, or toll-free in the continental US at (866) 378-5470.